Sorry, Hollywood Regency Tuxedo Bench is not currently available. Midcentury Hollywood Regency upholstered bench with ebonized frame. The new fabric in retro pattern in black and taupe with a light grey background. Hollywood Regency style bench. Gilded metal with a rope twist and tassle design. Measures: 19" seat height. 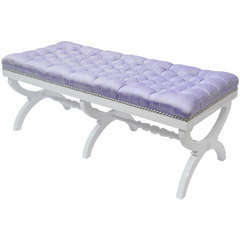 A Hollywood Regency daybed or bench with white frame upholstered in a faux alligator material with with buttons. 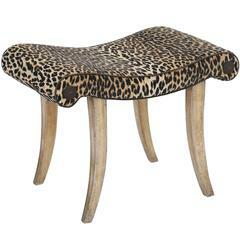 This whimsical and comfy bench, with its scroll legs has been reupholstered in suede leather. Its shape reminds Karl Springer coffee tables's design.